A holiday-time wedding doesn't have to include red! Try silver, gold or other metallics to summon the spirit of winter. To state the completely obvious, there are a lot of summer weddings. But what about those who choose to buck tradition and have a winter wedding? It makes sense: love, sharing, and family are written all over this time of year so what better season to celebrate the beginning of your lives together? Better yet, it doesn't have to scream "Christmas." 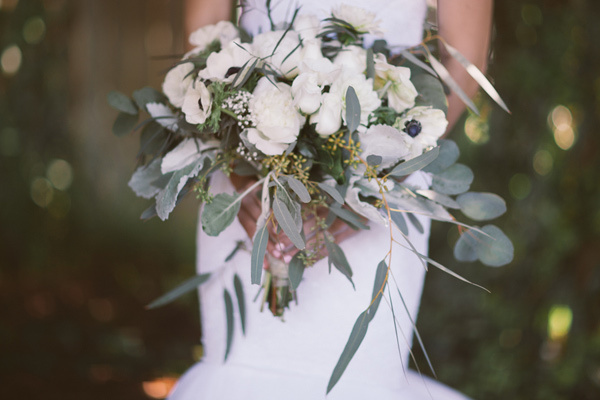 There are mountains of gorgeous styling ideas for couples with dreams of a winter wedding. Here's our round-up of ten winter-friendly pieces for holiday-timed weddings (that don't include red!). Take this opportunity to use a non-traditional floral in your arrangements and bouquets. Think eucalyptus, ferns, twigs, and other leafy or woody plants. Crystals and pearls make great hair adornments. We love this example from Twigs & Honey which can be wrapped around your head like a band or crown, or weaved through a fishtail braid. An ice-blue cake puts a twist on traditional white or ivory. A higher neckline and wide straps will keep you a little warmer than a strapless frock. Stay feminine and etherial with beaded embellishments like this gown by Jenny Packham. Still want to wear a strapless gown but have the option to cover up? No biggie. Top it off with a gorgeous cape like this one by Badgley Mischka. A fur wrap will keep your shoulders warm and is a great option for those with weddings in truly frigid climates. Still want to have an outside ceremony? No matter how much you warn guests that they should prepare and bundle up, someone will forget their coat. Ensure their comfort with some strategically-placed blankets. Edible gold, both in leaf and glitter form (glitter-topped donuts, anyone? ), adds the perfect amount of sophistication to the spread. We also love figs as the perfect cold-day fruit--especially when combined with gold like on this perfectly delectable cake by Crumb Fairy Bakery. The pine can easily be argued to be the mascot of winter trees. Give your guests a pine sapling that can be enjoyed for years to come. 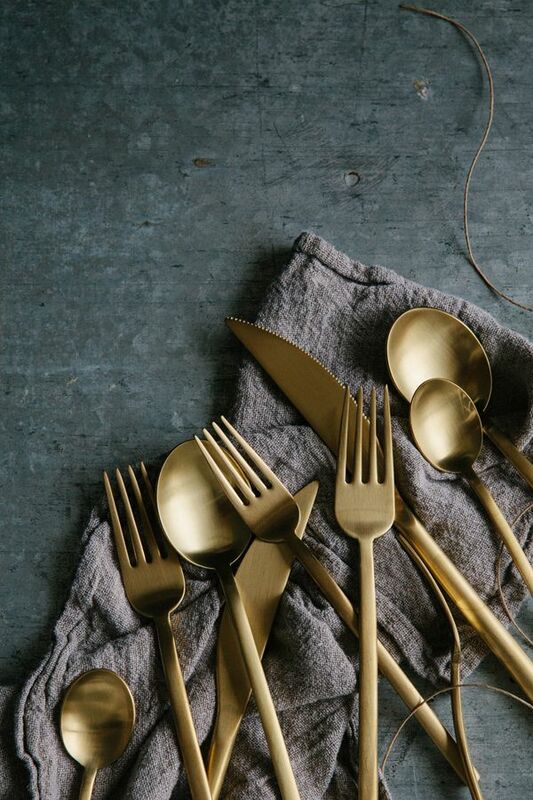 We're obsessed with gold flatware. It brings the whole table setting to another level and goes well with nearly any color scheme.